Tube Feeding Sick Cat Simba Iams Cat Food at the Veterinarian's Office. The food of choice for sick cat Simba was Iams cat food. Initially Simba was force fed Hill's Cat Food Critical Care a/d Formula and then when Simba was trasferred to a 24 hour vet, she was tube fed Iams Cat Food Maximum Calorie. These special pet foods are emergency high calorie high protein foods indicated for a cat not eating enough or not at all. I asked why the 24 hour vet chose Iams cat food and the veterinarian told me that the Iams Max Cal has more calories than the Hills cat food a/d critical care formula. Made sense to me! 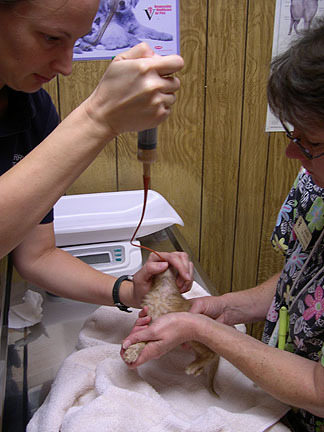 They want to get the maximum calories in with the fewest number of tube feeding sessions. Opening Simba's mouth to insert the feeding tube. 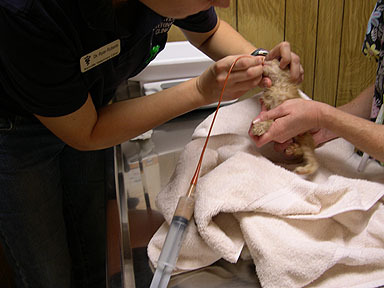 Notice that the veterinarian has her pinky finger on Simba's throat to be able to feel that the tube is going down the esophagus and NOT the wind-pipe. Pushing the tube down Simba's esophagus. Large syringe with tapered tip and flexible feeding tube attached. Feeding begins by slowly depressing syringe plunger.